You all remember our Flea Market Fixer Challenge with Valspar? 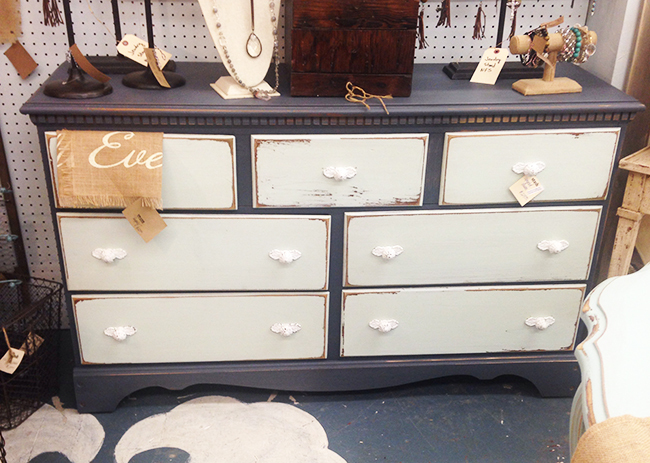 We found this really cool dresser to use as an entryway table. It was already painted in a flat navy and teal finish, and my goal was to turn it into a darker grey color with gold finishes. We used Valspar’s chalky finish paint to turn this piece around. Here is the before and photo! Usually to prep the piece you would want to lightly sand the surface if it is a glossy paint or texture. Since this was a matte paint that was already applied, we just cleaned the surfaces before applying the chalky finish paint. It was kind of wonderful to start painting and see an instantly thick rich color coat. If you apply a second coat make sure you have 4-8 hours in between to let dry thoroughly. There are 40 tintable color options for the paint, and Opera Gown was just what I was looking for. Wax Finish: To apply the Valspar Sealing protective wax finish we used an old cut up t-shirt and a paintbrush. Brush the wax on in small areas in the same direction, then wipe with the t-shirt to remove excess. Repeat until all the surfaces are covered. I was aiming for a more satin finish so we applied a second coat after we let the first one dry a whole 24 hrs, although you only technically need 4-8 hrs. 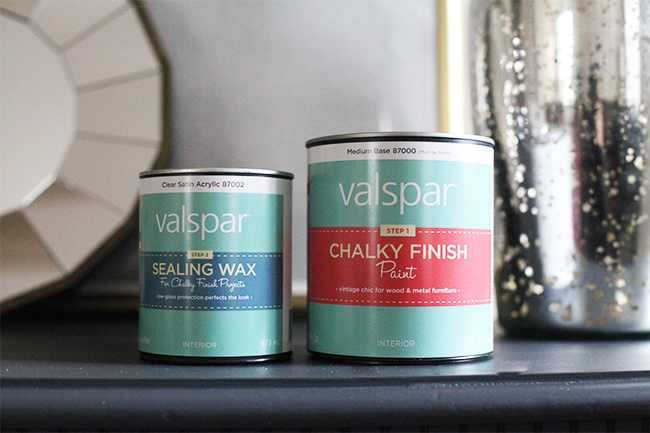 The Valspar chalky finish paint is now available at Lowe’s if you want to go tackle your next project:) I am on to my desk! It sits right next to the entryway table so I will also be painting it Opera Gown color. Will show you how it looks when it is all finished! This post is in partnership with Valspar. A brand we genuinely value and approve of. Thanks for supporting the companies who make this blog possible! Buying a Home: DIY or No? Love it! And the drawer lining is such a cool touch :). That is awesome! You did a great job! Anna-love it! Hope all is well! I updated a similar dresser (wood, without rails) a year or two ago, but honestly, I didn’t get the use I wanted out of it because the drawers were so hard to open. Not sure if it was because of the paint or if it’s just the negative of using an old dresser. Did you run into that at all? Do you use the dresser for clothes? Firstly: This looks gorgeous! You did such a great job, Anna! I’m such a failure when it comes to furniture painting. I want to use chalk color in many things (I’m really into it and I’m redecorating my home). But when I paint wood, it keeps a thick brush mark on the paint -would it be because the pain is too thick of the type of brush? Hey Kelly! It might be the brush, but when we used this paint, brush marks could be seen as we painted, but it dries smoothly. The paint settles a little after drying. However, if you still see the brush marks after it dries it is either the paint is too thick or the brush bristles. Test out a strip on the bottom of your piece to see how that does! I absolutely love this and the color combo! That green leaf is just the right balance. So sad I missed the Lou & Grey event…please have another event soon! Totally love the new look. Amazing job. I love that color and the gold really brings out the details in the pulls. I live in the furniture capitol of the world – I see a lot! But this could hang with anything here. And the styling is spot on. Is that mercury glass I see? (swoon) Great job! Anna – I love the way the dresser turned out! That color combination is top notch. Well done. 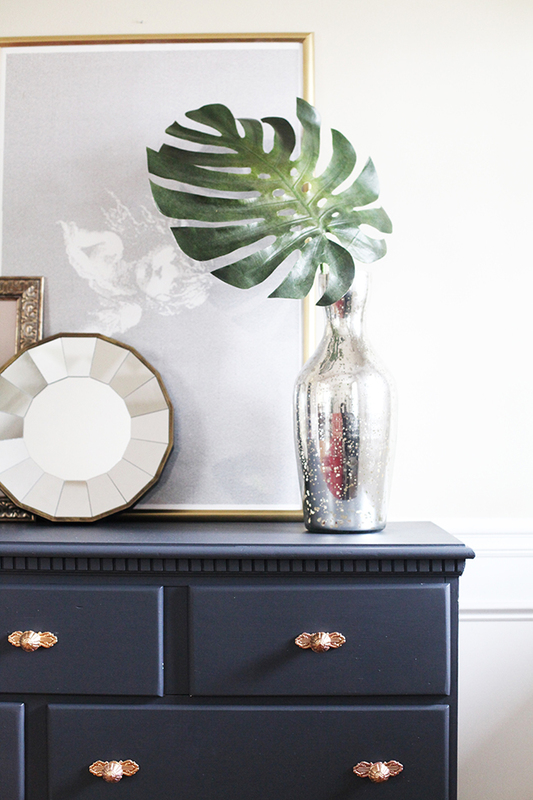 I also noticed the lovely large brass frame sitting on top of the dresser – and I’ve been on the hunt for one for a large wood print I have – where did yours come from?! Thank you so much Erin! I really appreciate the kind comment:) You know what? I actually bought a cheap frame at Michaels and spray painted it! I couldn’t find one like that either! love love love that color! looks great! Love the paint color on this piece. It looks so good, Anna. Oh, this is gorgeous! 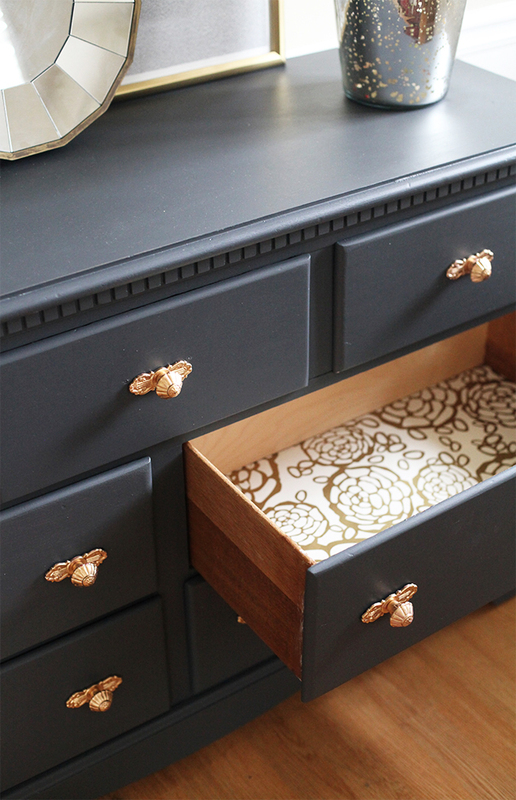 I love the colour, and I adore the idea of the drawers being lined with wallpaper! Hi! I love this dresser and how it’s designed. Where did you get the mirror? It’s beautiful. I love the knobs. Where did you buy them? What type of paint did you use on them? This is a beautiful piece! I am painting a dresser navy blue, but I’m having trouble getting a smooth look with the wax on the dresser top. I have used Valspar clear sealing wax several times before, but this is the first time I’ve used it on a darker color. The top looks very streaky; I can’t get a smooth, consistent finish. I’ve tried waxing small sections and wiping if off with an old white t-shirt, but it didn’t look blended. I tried again, waxing the whole top and wiping if off. It looked better, but still blotchy. Do you have any tips? Love the color, but my screen is showing it as a navy blue, but the color card in store looks grey, do you think it is more grey or blue? Hi Jennifer! It definitely has a deeper navy base to the grey, so it will depend on what the piece is up against. The wall color, what furniture it is next too, etc. It could reflect a more deep blue or a more charcoal grey. Solo though, it is more of a blue based charcoal. Was opera gown tinted with any other color? I saw paint swatches where it looked gray, but in your picture it looks blue. Loving that color! I have a dresser that I’ve been wanting to flip too 🙂 is the palm leaf real? Where do you find them? Hi Katie! It is fake but has a great texture and thick bendable center. I got it from Michaels! Hello! Your blog is so beautiful and I have loved looking through all of your creative and fun ideas! 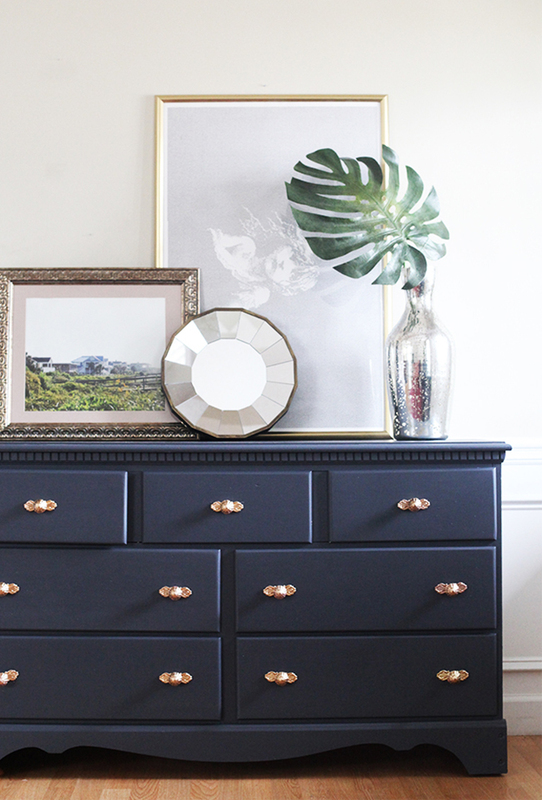 I recently purchased the Opera Gown paint because I plan on doing this same thing with a funky cool dresser of mine! I am just wondering if you knew what gold paint you used for the drawer pulls? I tried to paint mine with a gold paint and the paint didn’t stick so I am definitely not using the correct kind of paint! Thank you so much Skyler! I used a gold leaf paint! It applies much better and you can find it at Michael’s:) It’s a small jar of liquid. Omg! Thank you so much for getting back to me!!! Yay!!! I just ordered some incredible antique French Provincial Drawer Pulls off of Etsy and I will gold leaf them!! Thank you again so much!! Thank you so much for getting back to me!! I found some incredible French Provincial Drawer Pulls that will be perfect for my dresser and I will gold leaf them!! I’ll check out Michaels! Thank you again!! !